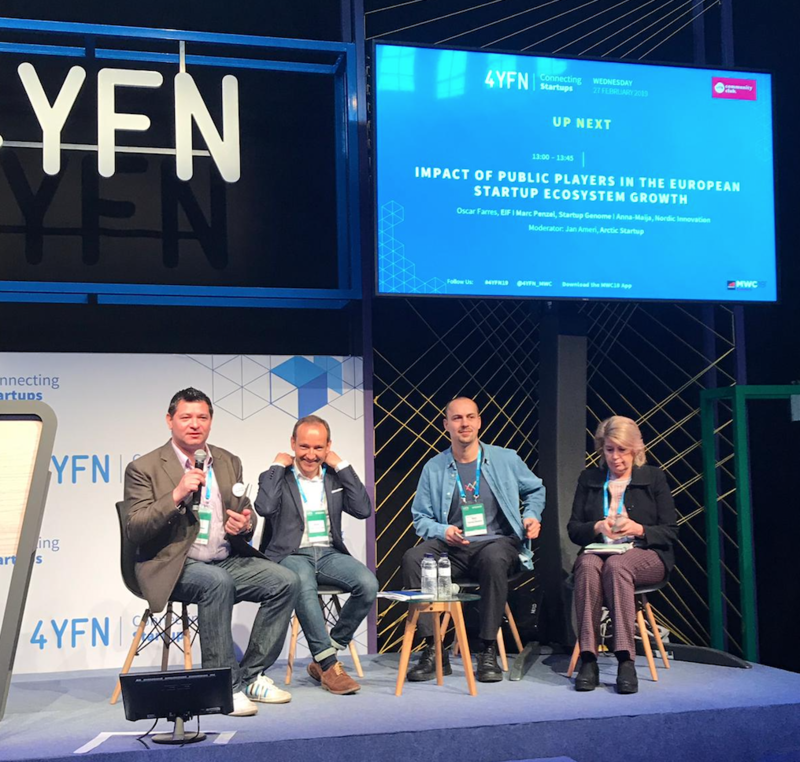 Last week, I had the pleasure of participating in 4YFN (4 Years From Now), the awesome startup-focused event that took place alongside the Mobile World Congress in Barcelona. The conference, which has grown from just over 2,000 attendees in 2014 to over 20,000 today (how's that for rapid growth?! ), focuses on making the future a reality faster. To do that, the event focuses especially on connections: between founders, with investors, with corporations, and with public entities. More connections among these groups will, ideally, lead to faster innovation and that near-term future (four years away) will get even closer. In addition to 4YFN Barcelona, additional 4YFN events will take place in Shanghai and Los Angeles. Anna-Maija Sunnanmark, senior innovation advisor at Nordic Innovation. Overall, startup ecosystems in Europe have made enormous progress relative to cities and regions elsewhere, and there are plenty of success stories to celebrate. Yet the panel agreed that Europe needs to think bigger and build more global champions. Prominent companies such as SoundCloud (which nearly reached the coveted unicorn status) and Take Eat Easy have stumbled, with sinking valuations, rescue financing, and even closure (in the latter case). We all put a strong emphasis on how to better enable and support scaleups so they can not only grow big quickly but also sustain themselves. This will help ensure that the positive economic impact of scaleups is widely felt. (In most countries and regions, scaleups contribute a disproportionate share of new job creation and economic value.) This involves further harmonization and integration of the European market and dedicated late-stage funds and growth programs. Public and private leaders must also focus on bringing entrepreneurs together (such as at 4YFN), and supporting their efforts to expand to global markets. In many countries, firms that export are the ones that enjoy the highest productivity and help keep their home country close to the global innovation frontier. Startup Genome's research has confirmed that startups that sell early on to global markets enjoy 2x faster revenue growth than those that sell mostly to domestic markets. Both the European Investment Fund and Nordic Innovation have recently launched initiatives focused on growth and scale. For example, the new Nordic Scalers will focus on helping more Nordic startups become Nordic scaleups, leading to greater economic growth in the region. Last year, we did a preliminary analysis of the factors behind scaleup growth (as part of our regional report on Frankfurt). We found that more globally-connected startups were more likely to become scaleups (as noted above). Additionally, scaleup firms had founders and executives with higher levels of prior experience in a startup or scaleup. Importantly, any program for scaleup firms needs to be put into the context of the Ecosystem Lifecycle. Key challenges need to be prioritized and addressed sequentially. Scaleup production rises at each phase of the Ecosystem Lifecycle, and certain investments at, for example, the early Activation phase may not bear fruit if other issues aren't addressed first. Effectiveness will be muted if you're trying to do all manner of policies and programs at once, rather than prioritizing. At Startup Genome, we're digging further into our data on startups and scaleups to better understand what leads to scaleup growth. We're also working with governments around the world to help determine what public policies and programs can be most effective--and at what point in the Lifecycle.